Two South African men who rent the house where athlete Oscar Pistorius shot dead his girlfriend Reeva Steenkamp have been filmed giving a “bizarre” tour around the property. David Scott, 33, and Kagiso Mokoape, 23, leased the house in Pretoria after it was sold by Oscar Pistorius to cover his legal bills. Oscar Pistorius family spokeswoman Anneliese Burgess described the footage as “bizarre” to the South African press. David Scott and Kagiso Mokoape show the South African TV channel Netwerk24 around the house. A version of the video is still on the network’s English language website. During the video, Dvaid Scott opens the toilet door, through which Reeva Steenkamp was shot four times, to show where she died. While in the bathroom, Kagiso Mokoape says: “I feel bad for Reeva’s parents”. The bathroom has since been refurbished. 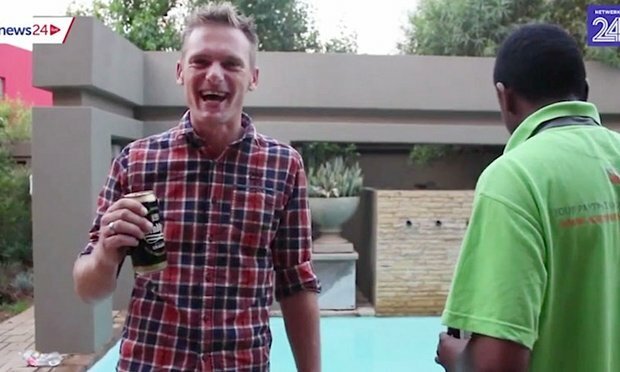 An online poll by the South African website IOL found that readers were closely split on whether it would be distasteful to hold a party at the house. The South African parole board is due to decide later this week whether to release Oscar Pistorius to house arrest. The Paralympic champion was convicted of manslaughter last year but cleared of murder. The appeal against the double amputee’s acquittal on murder charges is to be heard next month. Oscar Pistorius insists he mistook Reeva Steenkamp for an intruder.